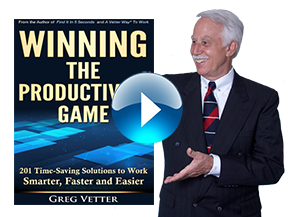 ONE-ON-ONE TRAINING | Vetter Productivity, Inc.
100% hands on taught with your learning style. At your learning speed with your personal and work items. In the privacy of your office. One-on-one personalized coaching allows you to experience and design an easy-to-use personalized work system and information storage system customized for you. A workbook is sent ahead of time which allows the individual to learn as much of the material as possible decreasing his training time. The more the materials are learned, the less time that will be needed to review the materials during the training. A form is sent ahead of time which allows the participant to list what they want to accomplish and the challenges they are experiencing. An exercise to develop your Categories for storing information in your paper and computer is sent. The concepts in the workbook will be reviewed. Categories for storing information will be reviewed. Your action system will be set up in your e-mail program. Your information storage system will be set. Each piece of paper etc. will be gone through in your office and Categorized. Your workspace and office will be rearranged for maximum productivity. You really “get it” because you are actually setting up and using your new system. 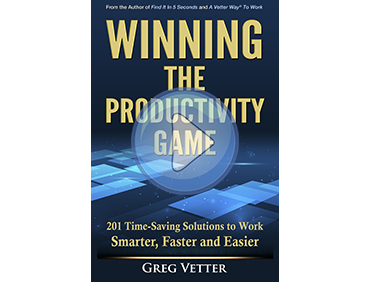 The result is an accelerated increase in your work productivity and organizational effectiveness. At the conclusion of the training, your physical office is completely organized and redone. Your e-mail program is set up as is My Documents in Windows Explorer. The very first day after the training you can begin using your system.